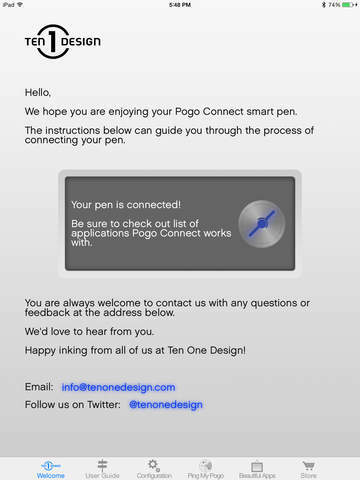 The companion app to your new Pogo Connect smart pen! This app will guide you through your first connection and setting up of your new pen. It will give you a chance to try out the pressure sensitivity function, and even serves as a guide to the many wonderful apps with which Pogo Connect is compatible. This app also allows you to configure your Pogo Connect for one of the many precision and brush tips now available for it. If you're anything like us, there may be times when you've forgotten where you left your Pogo Connect. No worries! The Pogo Connect has a battery life measured in months, so we've built a new function called "Ping My Pogo" which lets your find your missing pen around the house. It even flashes the light on the Pen so you can find it in the dark! You need to have an iPad 3 or later, or an iPad mini to connect with Pogo Connect.